The ship that was trying to lead a flotilla of aid boats to the blockaded Gaza has arrived to the Israeli port of Ashdod after being apprehended by the Israeli military. It was detained earlier on Monday and there has been no contact with it for hours. 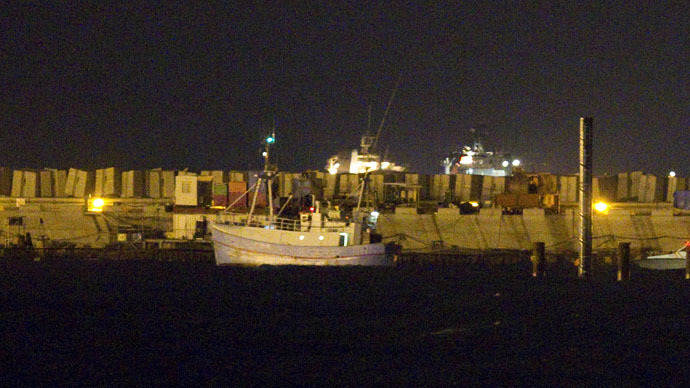 It is unclear what is going to happen to the people aboard the vessel, RT's Paula Slier reports from the port of Ashdod. They could be detained on the spot or escorted to the Ben Gurion airport to be sent out of Israel first thing Tuesday morning. RT columnist Nadezhda Kevorkova is on board the flagship, the Marianne. Prior to the ship's detention she said by phone that there was a military helicopter and a plane flying above and near the flotilla. Contact was lost at 10:57 GMT, the Freedom Flotilla Coalition said. The ships were some 100 nautical miles from their destination at that moment. The three other vessels that formed the flotilla with the Marianne turned back to return to their port of origin, the organization said. RT’s Paula Slier reported that passengers will likely be put on buses and taken to a deportation center and then to the international airport. The idea is for them to fly out as early as Tuesday morning, Slier said. “No doubt they are being detained; they will be questioned and will be refused permission for re-entering this country. The Israeli army has been tight lipped about this operation,” she said in a video report. There are a number of high profile people onboard the vessel, including the former president of Tunisia, Moncef Marzouki, and Arab-Israeli parliamentarians. The first passengers aboard the ship are now being released, Slier said. One of them, the Israeli MP Dr. Basel Ghattas, spoke with RT to describe what happened. He assured RT that their correspondent, who was aboard the ship, is okay and will likely be released in the early hours of Tuesday morning. Ghattas also confirmed that some of the passengers suffered minor injuries while being detained. Prior to being detained, Marianne’s crew left video messages. The captain of the vessel, Joel Opperdoes, said: “If you see this video, this means that we are under attack in international waters by Israeli Air Defense Forces.” Other messages had a similar tone. Another passenger onboard the ship, former US army colonel Ann Wright, told RT about her own reasons for joining the flotilla. “There are 1.8 million people that are living in Gaza, in this tiny little area. And it has been under siege for nine years. The people of Gaza need to know that the international community is concerned about them,” Wright said. Last summer’s assault by Israel on Gaza took a severe toll on the humanitarian situation. It has been estimated that around 40,000 homes were destroyed or damaged by Israel’s air raids, along with universities, schools and mosques. Around half a million people were left homeless. However, top Israeli officials have repeatedly denied Gaza’s need for aid. “In Gaza there is no humanitarian crisis whatsoever. I can say it very clearly, and there is no siege of Gaza and we have hundreds of truckloads of goods coming to Gaza every day,” Israeli Foreign Ministry Deputy spokesman Oren Rozenblat said. Israeli Defense Minister Mosche Yaalon even denied that the Gaza-bound flotilla had any aid on it. “There is no humanitarian crisis in Gaza or anything similar that requires a flotilla to bring aid to the Strip. Moreover, there was no humanitarian aid on this vessel. It was a provocation, which is part of de-legitimization of Israel,” Yaalon said. The last Gaza flotilla took place five years ago, when the Israeli army assaulted the aid boat, killing nine Turkish activists in 2010.